Three different holidays: You could say that Benalmadena holidays are a little like three holidays rolled into one, as its three distinct areas offer completely different experiences. Benalmadena Pueblo is the old town with grand historic buildings, cobbled streets and relaxed holidays. Then there’s Benalmadena Costa along the coast where you’ll see most of the new developments and huge all-inclusive hotels, as well as the famously beautiful marina. And finally you can spend your holidays in Arroyo de la Miel, which was originally a separate authentically Spanish village, but has now been absorbed by the ever-expanding holiday resort of Benalmadena. Lots to do: One of the most tourist-friendly resorts along the Costa del Sol, Benalmadena has a huge range of attractions and activities all vying for your attention. There’s fun for families in the amusement parks and aquariums while there are also historic castles to see too. Long promenade: The clean, sleek promenade that follows the coast is over 9km long and encompasses many beaches in Benalmadena. It makes for a pleasant walk at any time during your holidays, and you can always stop by at the bars, cafes and restaurants which border the promenade. Castillo de Colomares: Built between 1987 and 1994, the one thing you can’t say about this castle is that it’s very old! However, its lack of lineage does not detract from its intricate, awe-inspiring design. Intended as a monument to Christopher Colombus, much of the elaborate detail is reminiscent of La Sagrada Familia in Barcelona. Parts of the castle have even been sculpted into the shape of a ship! It’s certainly a must-see on your holidays to Benalmadena. Bil-Bil Castle: Created in 1927, this castle isn’t particularly old either. But again, the interest is in its architecture rather than its history. The deep red colour of the castle is a complete contrast to the white washed buildings of Benalmadena’s old town and the geometric shapes belie its Arabic origins. Tivoli World: This vibrant amusement park will remind you of classically styled fun fairs back in the UK. There are rollercoasters, water flumes, a big wheel and even a mini-train to have a ride on. You’ll also be entertained by the flamenco and fountain shows which are great for family holidays, and there are plenty of bars and restaurants to choose from if you’re feeling peckish. Sea Life: Suitably located near the water in Benalmadena marina, this large aquarium is a fun way to spend on afternoon during your holidays. There are brightly coloured octopuses, sea horses and clown fish (that’s the fish from Finding Nemo) but the real highlight is the tunnel where you can see lots of scary looking sharks swimming around you. Golf courses: Benalmadena holidays are close to two golf clubs, with Benalmedena golf club actually being within the resort just 1km away from the centre. It’s a very community-based centre, with classes, a driving range and competitions for local schools. In contrast, Golf Torrequebrada is a huge club with four different 18-hole courses with varying degrees of challenge. You can spend much of your holidays here enjoying the quality of the golf! Malapesquera Beach: Benalmadena holidays can lay claim to just under 10km of coastline, which is all followed by a clean promenade with protective banisters and ornate Victorian-style lamp posts. Malapesquera is the main beach in the resort, as it’s very centrally located and has a wide sandy stretch perfect for sunbathing during your holidays. Torre Bermeja Beach: This lively beach is best suited to those who like to keep active on their holidays as there’s a beach football pitch and volleyball nets set up permanently. Out to sea the fun continues with water sports such as waterskiing and parasailing, or you could always opt for a more relaxing ride on a pedalo. Viborillas Beach: In contrast to the other beaches, Viborillas is bordered by green shrubs and trees, instead of the usual roads and promenade. Even though it’s quite small this beach can still be pretty popular over the summer, mainly for its lush hillside views and soft golden sand. Pinoccio’s: This highly-rated restaurant in the heart of Benalmadena serves contemporary British food and Spanish tapas in a warm, friendly atmosphere. Attention to detail is crucial to the staff here, and the service is of an exceptionally high standard. You’ll also appreciate the fantastic views out to sea, with the chance to catch a glimpse of the local family of dolphins! Il Girasole: An authentic Italian restaurant in the heart of the Costa del Sol. The dishes are perfectly cooked using locally sourced ingredients with freshly made pasta. Highlights from the menu include tomato and aubergine pasta or chicken with a mascarpone and brandy sauce. Blue Lamp: A great value restaurant serving a variety of British and international cuisine. Almost every taste is catered for and the menu of the day for just 10 euros makes your money go even further on cheap holidays to Benalmadena. 24 hour partying: Benalmadena holidays are known for their lively frenetic nightlife, although perhaps not as famed for their revelry as holidays to Torremolinos. 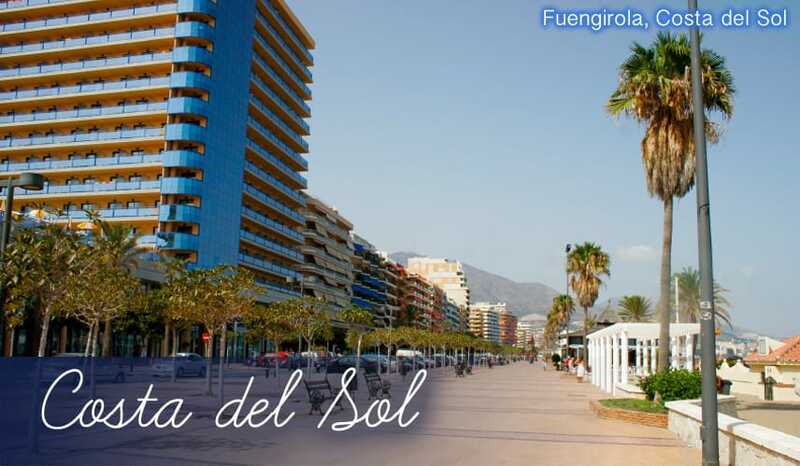 However, it’s not for nothing that the main partying area in Benalmadena is known as the Sol y mar ’24-hour’ square! Here you’ll find the loudest clubs such as Kiu and Mango which both stay open until late morning (around 8am or later!). Benalmadena Marina is often voted as one of the most beautiful harbours in the world, but it’s the clubs and bars here that really demand your attention. We’re talking about places like Boals Ice Bar, and exactly as the name suggests everything (and we mean everything) is made of ice. It’s truly a unique drinking experience. Aside from that, the Aqa disco is also a great place o party around the marina, and its tropical garden style setting attracts a young, trendy crowd on their holidays in Benalmadena. Shopping by the seaside: When it comes to shopping, Benalmadena holidays don’t quite have the wealth of choice that Torremolinos holidays have. Your best bet would be to visit the shopping centre at the marina – there are over 200 shops inside selling everything from perfume, to alcohol, chocolate and of course stylish clothes!